Originally, Slime was a toy product manufactured by Mattel, sold in a plastic trash can and introduced in February 1976. It consisted of a non-toxic viscous, squishy and oozy green or other color material made primarily from guar gum. 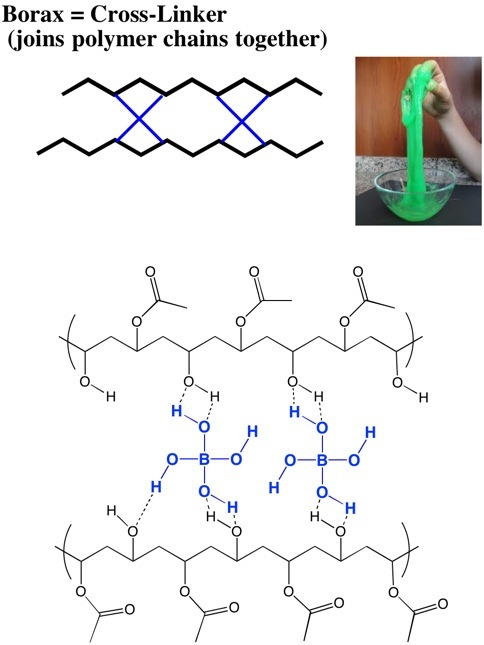 Today, children everywhere have discovered how to make their own slime by using Elmer’s glue. 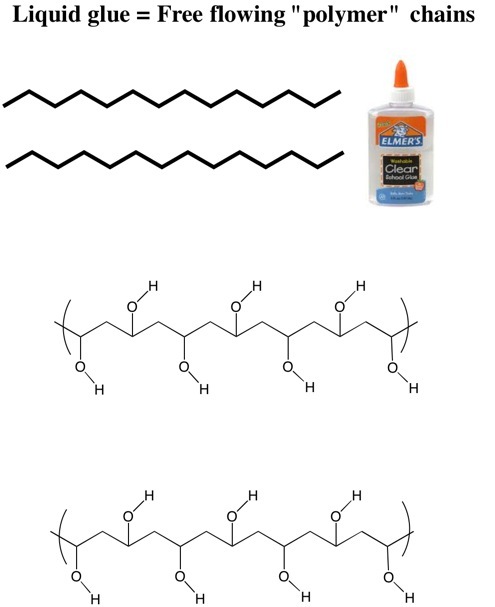 So what exactly is in Elmer’s glue? It is a plastic polymer of polyvinyl acetate (PVA). Glue, historically, is indeed made from collagen taken from animal parts, particularly horse hooves and bones. In fact, the word “collagen” comes from the Greek kolla, glue. This practice has been going on for thousands and thousands of years; it’s not the invention of some enterprising farmer named Elmer who had a few about-to-be-put-down horses on his hands, a knack for organic chemistry and a vat of boiling water. Elmer’s Glue introduced PVA glue in 1946. Below you’ll see the structure of PVA. It is composed of many individual units of the chemical compound vinyl acetate. These individual chains of the PVA molecule slide across each other until a cross-linking agent is added such as borax, which is sodium tetraborate decahydrate (Na2B4O7 • 10H2O). This increases the viscosity of the polymer (glue). Borax tends to be a harsh on your hands. 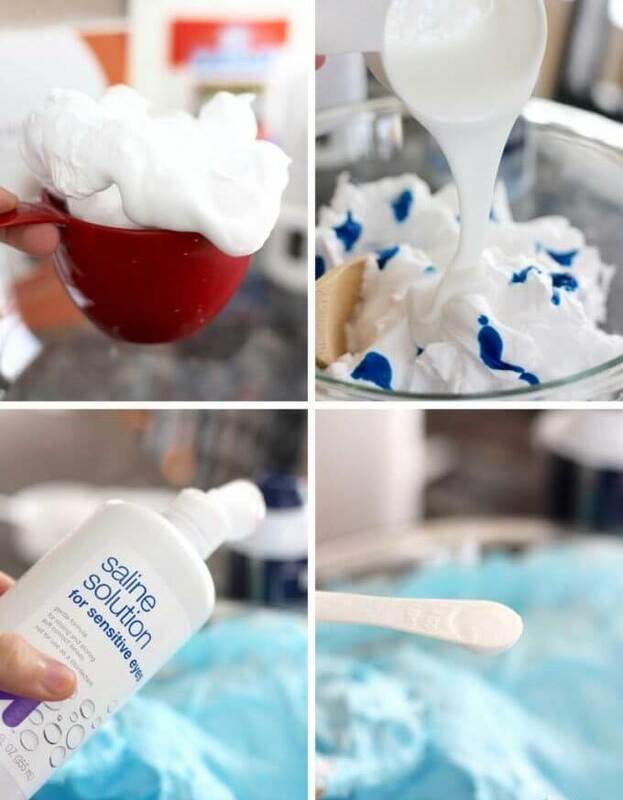 For an almost borax-free fluffy slime you need white washable PVA school glue, foaming shaving cream, baking soda, and saline solution (contains both sodium borate and boric acid as ingredients). 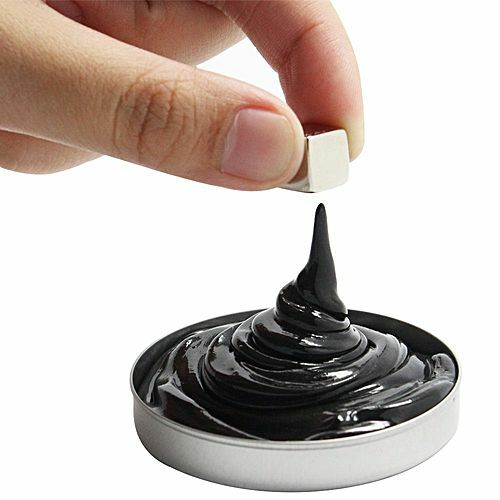 Another interesting slime recipe is the magnetic slime! Adding iron filings to the slime makes it magnetic. If you place the magnetic slime in a glass jar and run a magnet up the side of the jar the magnetic slime will flow up the wall of the jar. For more recipes visit Elmer’s Glue. COSTELLO provides the chemical process industries with innovative chemical and environmental engineering services, advanced and emerging process technologies, and regulatory compliance support that optimizes client expenditures and manpower requirements.